This recipe makes light, fluffy, and utterly delightful pancakes with just a few simple ingredients. After you make these pancakes once, you will never reach for the pancake mix again. One thing to keep in mind is that you don't overmix pancake batter—this can cause your pancakes to turn out rubbery. Just mix until the dry ingredients are mostly incorporated into the wet, with some lumps still visible. Then let the batter rest for 20 minutes. This gives those lumps a chance to dissolve and the glutens in the flour to relax. You can actually hold the batter in the fridge for several hours if need be. As a matter of fact, it'll even hold up pretty well overnight. 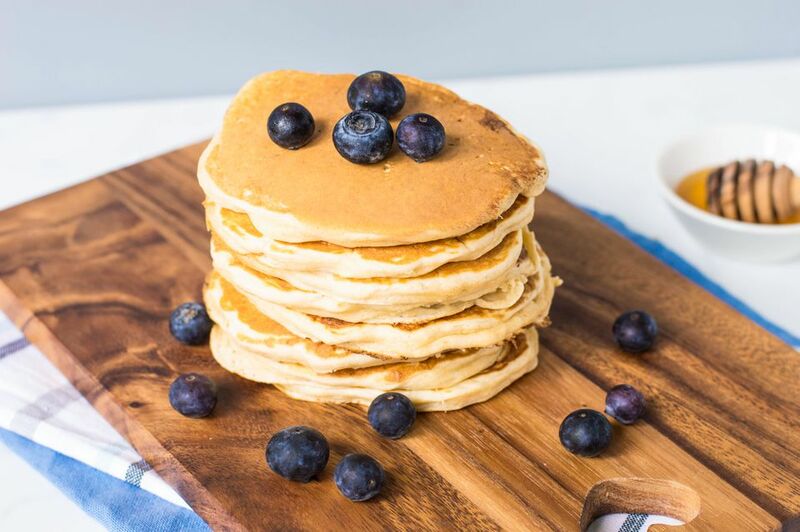 If this is your first time making pancakes, you will want to get a few tips and tricks under your belt before you begin preparing breakfast for the family or weekend guests. Sift together the flour and baking powder in a large mixing bowl. In a separate bowl, beat the eggs thoroughly, then stir in the milk, sugar, and salt, and mix until the sugar is dissolved. Stir in the vanilla. Add the wet ingredients to the dry and use a fork to gently, but thoroughly, combine until most of the dry ingredients aren't dry anymore. Make sure not to overmix—you'll still see some lumps. You can gently break up some of the bigger lumps with your fork, but don't mix for much longer than 20 seconds. Let the batter rest for about 20 minutes. Toward the end of that time, preheat your griddle to 375 F or heat a nonstick skillet over medium heat. Preheat the oven to 170 F to keep batches of pancakes warm. When your cooking surface is hot, lightly spray it with cooking spray. For each pancake, ladle 1/4 cup of batter onto the griddle or pan. Cook until the tops of the pancakes are full of bubbles and the bottoms are golden brown. Flip the pancakes and cook until the tops are golden-brown. Either serve right away or transfer to the oven to keep warm. If you are finding your pancakes just aren't turning out right, it could be that your baking powder has gone stale. If it's been more than 6 months since you bought your baking powder, toss it and buy a fresh container. When baking powder gets too old, it won't rise as much as it should, and your pancakes will be heavy and dense rather than light and fluffy. Another problem could be how you are measuring your flour. Make sure you weigh your flour, not just scoop it out of the bag. If you scoop, chances are your pancakes will be thick and dense rather than light and fluffy. For some added nutrition, you can substitute plain yogurt for half the milk. Your batter will be thicker, so lower your griddle temperature a little. But the pancakes will still turn out fluffy, and the extra tangy flavor is heavenly. And tell your kids not to worry—you can definitely add chocolate chips to this recipe! A cup of fresh blueberries is another welcome addition. You can use frozen ones, too, as long as you thaw them first, but these are more likely to bleed color into the batter. Which is not necessarily a problem, just be aware of this in advance and stick to fresh blueberries if you want to avoid that.